This is a condensed version of this interview. Click here for full version. It is available to members of the site or on a pay-per-view basis. Ronnie Beard has an expansive background in the industry that involves countless relationships with the best in the business. His love of horses began as a child in Fairfax County Virginia, an area rich with horsemen and mentors. He spent years running one of the most famous stables in history, which produced many top athletes and horses. Beard now spends countless hours giving back to the business by heading the Developing Riders Program and the Emerging Athletes. 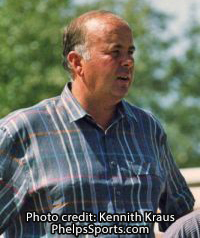 He is also a member of the Show Jumping High Performance Committee and a former USET Foundation Trustee. Beard was lucky enough to live directly behind the Fairfax Hunt Club (home to Joe Fargis). He started riding Stock Seat on a Quarter Horse, but most of his friends and neighbors rode Hunt Seat. He begged his parents for an English saddle and taught the western horse to jump. Soon after, he joined in lessons with local trainers like Mrs. Dillon of Full Cry Farm, and Madge Barkley and Mildred Gains of the Madeira School. Gene Cunningham, Jimmy Lee, and Kenny Wheeler have been long time mentors as well as Chef dEquipe George Morris. He joined the Honor Guard in Arlington VA, during the Vietnam War. It was a great experience and taught Beard meticulous horsemanship. Beard was at Fort Meyers for over two years and learned about discipline and hard work there. Later, he opened Reston Riding Center and was fortunate to have General Jonathan Burton help him with his riding. After two years at Reston Riding Center, Jimmy Lee sent Beard to work for Mr. James B. Caine on the Eastern Shore of Maryland. Mr. Caine ended up being the sponsor of a lifetime, building one of the most grandiose indoor facilities ever constructed. The 225 X 175 indoor arena which was almost twice the size of Madison Square Garden, was decorated with giant chandeliers and state of the art equipment. Riders such as Melanie Smith, Buddy Brown, Bernie Traurig, Robert Ridland and Katie Prudent rode there on horses such as Gozzi, Old Dominion, South Side and Jet Run. When the business ended, Beard moved to Southern Pines, NC, and started South Run Farms with the goal of getting Robert Ridland to the 1976 Montreal Olympics. Shortly after that goal was realized, Michael Dorman started riding with Beard, showing talent and a great interest in learning the business. 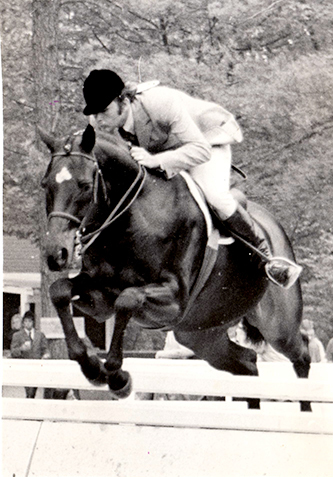 Beard mentored the young rider, who had previously ridden with Hugo Vidal as a Junior, into a competitive member of the United States Equestrian Team. Dorman was the top rider in the 1990 Dortmund, Germany World Cup and rode on several winning Nations Cup Teams. Eighteen years later, the pair now runs Wyndmont Farm together, training, riding, buying and selling hunters and jumpers. Michael has a great aptitude for taking what he has learned and teaching it to others, Beard explained. Dorman shares in the management duties of Wyndmont, allowing Beard to have a side career judging. He is an R Hunter/Hunter Equitation Judge and has done the Medal Finals twice, as well as the USET on East and West Coasts, the ASPCA Maclay, and Washington International Horse Show Equitation Finals. A narrated video presentation celebrating the extraordinary contribution the Thoroughbred horse has made in all the jumping disciplines. Until the very recent past Thoroughbreds dominated North America’s competitive jumping scene with their superior athleticism, heart and jumping prowess. Their popularity sadly declined as warmbloods descended en masse upon the horse show industry beginning in the early 1980s. Thoroughbreds seemed to virtually disappear as seemingly “easy-going” warmbloods gained momentum and cachet. This video is a reminder that some of our most outstanding and beloved equine athletes of all time were proudly Thoroughbreds. Not only should we remember their profound influence, but applaud and encourage their reemergence into the mainstream of the equestrian sport. Ronnie Beard takes us back to the Working Hunter Classics featuring some of the great Thoroughbreds of the 70's and compares them to todays Hunter Derbys. Bernie sits down with renowned trainer, coach and judge, Ronnie Beard, to reminisce about the glory days of Winter Place Farm. The opulent facility was way ahead of its time and the horses and riders that emerged from there would become legends. It was nothing but the best for Mr. Caine, the farm’s owner, and he turned to Ronnie to make his dreams of showcasing champion horses and world class riders come true.